The Volvo Ocean Race enjoyed another impressively close finish as leg five from Auckland, across the Southern Ocean, round Cape Horn and up to Itajaí, Brazil concluded with the top four boats all finishing within one hour after 6,776 miles and some 19 days at sea. Ultimately it was Ian Walker's Abu Dhabi Ocean Racing team that edged ahead of Team Alvimedica last Thursday as the boats went through their 'last' transition zone, to the southeast of Buenos Aires and managed to cling on the lead following a final en masse tack for the finish line on Saturday. 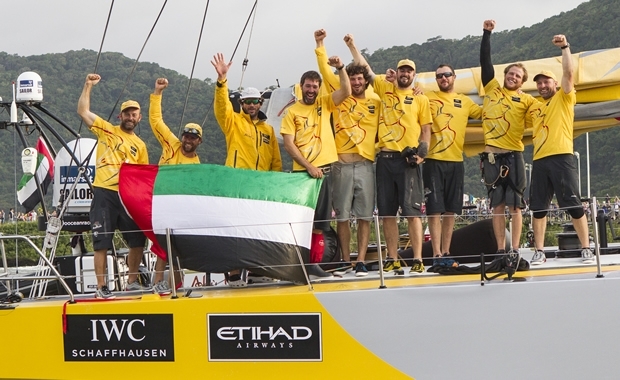 The UAE-based VO65 crossed the finish line at 16:30 local time on Sunday in a time of 18 days 23 hours 30 minutes and 10 seconds. As a testament to how the VO65 one designs have turned this Volvo Ocean Race into such a competition, after five legs Abu Dhabi Ocean Racing becomes the first team to have scored two leg victories and has scored podium finishes on all the legs to date. In terms of the overall leaderboard, this leg could not have been better for Walker's team - Abu Dhabi Ocean Racing started leg five tied on point with Dongfeng Racing Team's, however following the top mast breakage and subsequent retirement of the Franco-Chinese team, Abu Dhabi Ocean Racing has now soared into the lead holding a seven point advantage. During the leg Abu Dhabi Ocean Racing set a new 24 hour distance record for VO65s covering 550.82 nautical miles at an average speed of 22.95 knots on the approach to Cape Horn, in the process winning the IWC prize. The final 2,000 miles from Cape Horn past the Falkland Islands to Itajaí remained very challenging. During this period they dropped the keel on two occasions in the heaviest of the weather losing some ground, but keeping his boat intact. “In hindsight, that looks a pretty shrewd decision,” Walker said. As the fleet emerged from the Roaring Forties, the extreme conditions slowly moderated over the final five days of the leg as lighter winds ahead of the fleet compressed the four-boat pack and narrowed ADOR’s lead. At dawn on the final day just 10 miles separated the top four as Walker’s crew led into the final 100 miles. “The racing has the same intensity as an inshore race with boat on boat tactics rather than large scale navigational decisions deciding the final outcome,” continued Fisher. After a day of nervously covering the chasing trio as the winds progressively faded on the approach to the Brazilian coast, the ADOR crew finally hooked into solid southerly winds for the final 10 miles and crossed the line a little over six-miles ahead. Second to finish, just over 32 minutes behind ADOR, was leg four winner, MAPFRE, with Iker Martinez back on board in the skipper's position, while Team Alvimedica was 20 minutes behind in third, finishing just one minute, 16 seconds ahead of Team Brunel. Scoring their second podium finish on this leg, Charlie Enright's young crew enjoyed a major achievement on this leg, leading the fleet around Cape Horn. Enright adds it’s the team that is making the difference: “The team is our strength. We don’t have a lot of egos – everyone is in it for the result. When it’s time to be tough and dig in, we seem to do that quite well. I think that showed as we rounded the Horn." Meanwhile, Team SCA is still limping towards the finish having had more than her fair share of problems, damaging three sails and then suffering a port rudder breakage on Sunday. She is expected to finish on Tuesday. Dongfeng Race Team is now being motorsailed to Itajaí where her shore crew face a race against time to have the new mast refitted in time for the start of the next leg to Newport, Rhode Island. The Itajaí In-Port Race is scheduled for 18 April with the start of Leg 6 to Newport, USA the following day.